May 2004 marked the twenty-fifth anniversary of what turned out to be a watershed in postwar politics - the election of Margaret Thatcher as Conservative Prime Minister. 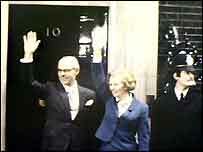 She defeated James Callaghan at the polls after the so-called Winter of Discontent. Mrs Thatcher promised to reduce the power of the unions and strengthen Britain's economy, three years after Labour had been forced to go cap in hand to the International Monetary Fund to bail Britain out. But her battles with the unions and her attempts to create an enterprise economy, as she called it, caused conflict on a wide scale. While many admired her toughness and determination, at home and abroad, others loathed what they regarded as her uncaring attitude to the casualties of economic change. It helped, of course, that throughout her period in power she faced a divided opposition with her main enemy, Labour, weakened by the defections to the newly-created Social Democrat Party. Twenty five years after she came to power, and with the help of admirers and rivals, Terry Dignan looks back over the Thatcher era. So where is that legacy now? 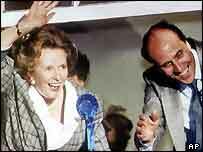 Norman, now Lord, Tebbit was the minister who pushed through those key reforms to trade union laws, and was Tory party chairman for her third general election victory in 1987. We put it to him that, although Mrs Thatcher changed Britain as much as any peacetime prime minister in the last century, she was also a highly divisive figure.